Don’t make the mistake of underestimating the importance of a quality desk lamp. Choosing the right desk lamp for your environment will make a big difference. Whether you are reading, working at night, or using the computer. Knowing what you need the light for is the first step in choosing the right lamp, but there are plenty to come afterward. Are you interested in finding the best table lamp for your desk? You certainly have a lot of options. LED desk lamps are always a great choice. Every lamp has its area of specialty. Some are great for reading, others studying, some for work, others for crafts, and some are just great for eye care. Here are the top five best desk lamps on the market today. 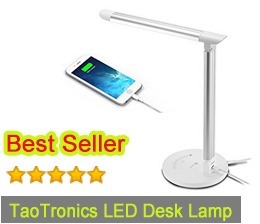 First on the list is the eye-caring table lamp from TaoTronics. This lamp is exactly what you would expect from a top-of-the-line desk lamp manufacturer. It features a sleek design, non-flickering eye care technology, touch controls, color modes, and a USB charging port. It easily has enough features to warrant three times the current price, which is just another impressive stat for this lamp. 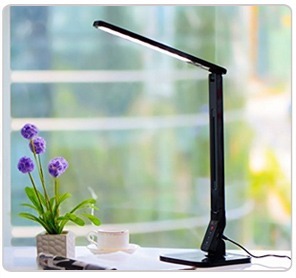 TaoTronics claims that this lamp can reduce your energy spending by 75 percent. That is, the energy you spend to power your current desk lamp. For the most part, this is completely true. The only case where this claim might not be correct is if you are already using an energy-efficient LED desk lamp. This is still a great lamp worth purchasing even if you are already using a LED lamp. If you’re looking for a sleek, affordable upgrade, then this is a great option. It has seven dimming levels and five different color temperatures. Those temperatures include natural night, yellow, warm yellow, white, and cool white. Adjusting the light temperature allows you to set the perfect mood for whatever task you are performing. The flicker free technology is great for the eyes. Most lights flicker constantly. They often flicker too fast for us to really recognize, but it takes its toll on our eyes. As a matter of fact, most lights flicker around 120 times a second on average. Some will flicker at different rates depending on the power source. This lamp from TaoTronics is rather short and compact, but it does have a lifespan of 50,000 hours with an intensity of 410 Lumen. The simplistic, modern design makes it perfect for any room, whether an office, bedroom, or living room. It has a large, round base with touch controls that are easy to access and understand. Just above the base is a USB charging port. – An affordable option with a lot of features. – Eye caring technology without any flickering. – Isn’t tall enough to illuminate a large desk. Final Verdict: This LED desk lamp from TaoTronics is one of the best desk lamps for eye-caring. It’s affordable and features a really sophisticated design. Just don’t expect it to illuminate a large desk. This is another short lamp, but it easily makes up for it with its many powerful features. Most would agree that this is the ideal desk lamp for long hours of studying. It has 4 different lighting modes and 5 levels of brightness that can be easily controlled. It also utilizes an anti-flickering technology so that those long hours of reading or studying don’t hurt your eyes and head. The body of the lamp is very easily adjustable. It can be adjusted and rotated a full 180 degrees at the base. Further up the body is a second point of adjustment, above which is referred to as the “light head” where the long bulb is placed. These adjustment points also allow you to fold the lamp down to a compact size for easy storage. Speaking of bulbs, this lamps comes with high-quality, handmade bulbs that have a lifespan of 25 years. That’s not 25 years of straight use, but that’s still a long lifespan for a bulb. As for features, it has a 1-hour auto timer that can be used to automatically turn the light off. This is great for those nights where you might fall asleep reading or if you leave the room and forget to turn the light off. It’s a nice feature that saves energy and extends the lifespan of the light. – Very flexible and can be folded down for storage. – 1-hour auto-off timer can save energy. – Would be nice if it had a USB charger. Final Verdict: This LED desk lamp is perfect for studying. Its flexibility makes it easy to turn and focus the light on a different book or sheet of paper. The auto-off timer helps just in case you fall asleep while studying. 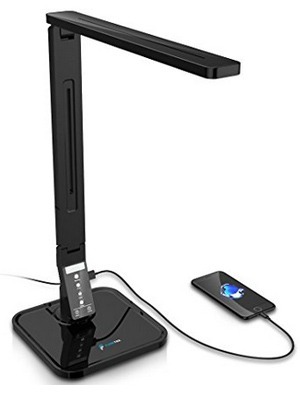 If you are looking for the perfect desk lamp for reading, then look no further than the Fugetek FT-L798. It’s short, simple, affordable, and has enough features to make even the best picks of buyers happy. It’s one of the few LED desk lamps that implements recessed lighting. The recessed lighting is slightly easier on the eyes and makes reading for long periods of time more comfortable. The LED bulbs used for this lamp have a lifespan of 25 years given regular use. Leaving the light on 24/7 will undoubtedly cut that lifespan down dramatically, but who does that? On average, it will consume about 14 Watts. That’s slightly higher than some similarly sized models but is still in the range of “highly energy-efficient”. There are quite a few different lighting options available. First are four different lighting modes. Set the appropriate mode according to what you are doing. From there, you have an option of five different levels of brightness. That’s the same amount of lighting options as the Vont lamp, but the lamp from Fugetek has a few extra features you might prefer. The first of those features is a USB charging port. It puts out a standard 5 volts and can supply up to 1.5 amps of electricity. It’s designed for keeping your smart phone charged while you’re deep in your reading material. – Recessed lighting is very comfortable on the eyes. – Affordable, yet has plenty of neat features. – Touch controls that are easy to access. – Some don’t like the always-on “power connected” light at the base. Final Verdict: This lamp is great for reading. It has an auto-off timer just in case you fall asleep while reading. The recessed light is easy on the eyes. Best of all, it’s very competitively priced. This LED lamp from Pulnda is great for working on the computer. It’s the first lamp on this list that doesn’t feature the same straight design with multiple points of adjustment. It’s also the first lamp on the list that attached to the desk via a clamp. It doesn’t come with a bunch of extra features, such as touch controls, but it’s still a great lamp nonetheless. The entire body of the lamp is flexible. It can be turned, twisted, or angled as you please. You can clamp it anywhere along the desk and point the light where you want. It features a very durable aluminum lamp head and an eyeshield light source. There are two levels of brightness included, but no adjustments for the temperature or color of the light. It’s not a single, long LED like some of the other lamps, but rather a series of 18 LEDs that put out a total of 300 Lumen. The lamp is powered by 5 volts with a USB cord. You can power it from your laptop, from a wall adapter, or from a chargeable power source. – Can be powered by your laptop. – No light mode options or temperature controls. Final Verdict: This is a great lamp for computer work. If you’re simply interested in having comfortable light without all the bells and whistles, this is great. 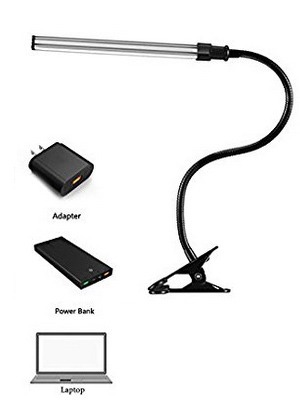 If you are working on a laptop away from the desk you can take the light with you and power it from the laptop. 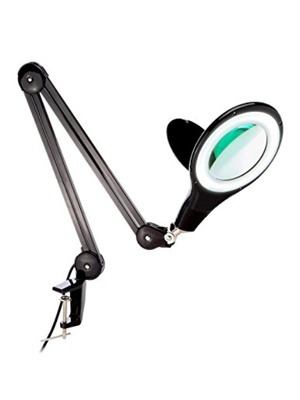 The final lamp on this list comes with a powerful magnifier capable of 2.25X magnification. The light itself produces a very noticeable 650 Lumen. This lamp is great for drawing, painting, and other forms of arts and craft. The light is very sharp and focused on whatever detail has your attention. The arm can extend up to 38 inches. That makes it significantly taller than any other lamp on this list. That also means it can easily move around to different areas on the desk. 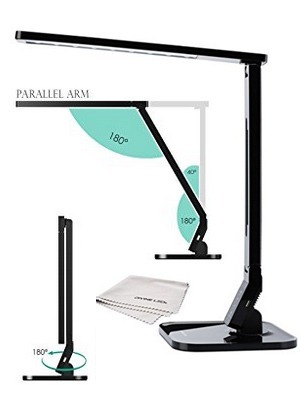 If it can’t reach a point with its long arm, then you can simply unclamp it and clamp it to a side of the desk closer to the area you need illuminated. 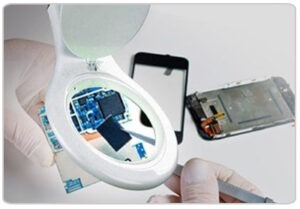 – Magnification allows for a greater focus on details. – Very durable, lightweight, and flexible. – Can be a bit pricey compared to others lamps on this list. Final Verdict: This lamp is perfect for drawing at your desk. The magnifying lens makes it easy to put any single detail into focus. Which lamp on this list is the best? That’s for you to decide. Carefully consider the activity you do most often at your desk and then find the lamp best suited for that. Below is guide to help you make decision. The following buying guide is broken down into appropriate sections. First, we’ll consider the need for the lamp and which desk lamp would be best suited for that task. Afterward, we’ll cover some of the many functions, features, and qualities of lamps on the market today. By the end of the guide, you should be able to use this information to make better purchasing decisions. What Are You Using The Lamp For? In some cases, a single lamp will work effectively for all of the tasks. However, just because it works effectively doesn’t mean it’s the best lamp for the job. If you want your crafts to have that special touch or if you don’t want your eyes to hurt after prolonged periods of reading, then you need to find the best lamp for that particular task. Let’s go down the list and see which qualities are important for each individual task. When choosing a desk lamp for reading you must consider the lamp as well as the light. The light itself should provide a soft glow that allows for comfortable reading without straining the eye. The lamp itself should not be too tall and it’s always best if it is flexible enough to swing around. A smaller, focused lamp is enough for the job. When it comes to studying, you face the same predicament as with reading. After all, much of studying is simply reading. However, you are more likely to have a cluster of papers or folders on the desk you are utilizing. The small, focused light won’t be enough to illuminate the table. Instead, a taller lamp will work better. Again, with arts and crafts, you want a taller light. A taller lamp will always light up more desk area with a proper bulb. For the most part, the same lamp used for studying as for arts and crafts. As long as the lamp is very flexible in terms of direction and position of the light. You will need to illuminate different areas at times to maintain focus. The light itself is extremely important as well because it will impact the appearance of certain colors. For the most part, it’s safe to assume that a LED lamp is the best option for any of the tasks above. Not only is LED light extremely energy-efficient, but it looks great as well. You still need to consider features such as the lumens, the watts, and what additional functions are available. First, let’s look at some of the most important functions of a desk lamp. The height of the lamp determines the overall working area. Some lamps have a bend in the middle so that the height can be adjusted. 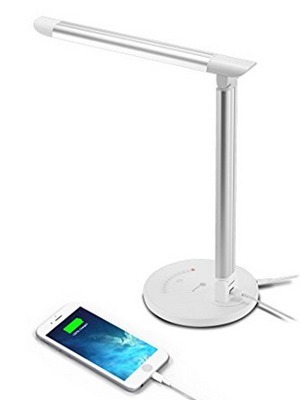 Thus, if you need only a portion of the desk lit up or if you need the entire desk illuminated, you can adjust the height of the lamp to adjust the working area. It’s also a good idea if the lamp is adjustable at the base so that the length of the lamp can move about the surface of the desk without lifting the lamp. As lights become more modern they have more features. If you have a lamp with extra features, such as adjustable brightness or colors, then you definitely want a lamp that comes with easy controls. Some lamps have controls that require lifting the lamp to use them, which is a big hassle. Controls should be located on the outside of the lamp and easy to access. A lamp that comes with a separate controller is a great option. For the most part, power consumption relies on the bulb used. However, this can differ if you are using a lamp that has some extra features requiring their own power supply. LED lights are very energy-efficient, so power consumption is rarely a big issue. However, if you have a LED lamp with several bulbs and various colors, then the wattage could start to climb. Pay careful attention to the number of lights the lamp uses and the wattage of the lights you put in it. What sort of additional features should you look for in a high-quality lamp? An adjustable timer is a fairly basic feature that can save you a few bucks if you forget to turn off the light at night. Some of the lamps have built-in clocks with displays. You set the time for the light to shut off and it does the rest. A charging port is also a fairly nice feature. Plugging up your lamp is going to use up one of your available outlets. This might make it a bit more difficult to charge your phone, especially if a computer is plugged up as well. A lamp with a charging port lets you charge your phone with a standard USB cable via the base of the lamp. The best desk lamp is a lamp that is right for you. One that is the right height, has the right features, and comes with the right price tag. Use this guide to help you make a better decision when you’re shopping for a new desk lamp.